Today one of my kindergarten students pointed out the crocuses poking up their hopeful little heads in our school garden. And then we drove through a flash snow storm on the ride home from skating practice. I always get so excited when I see the first little buds of spring start to blossom. And, as spring begins to show it’s earliest signs, I can’t help but think of Easter. It makes me want to decorate with all kinds of fresh pastel colours; pinks mixed with blues, aqua, greens, and a few pops of yellow for good measure. 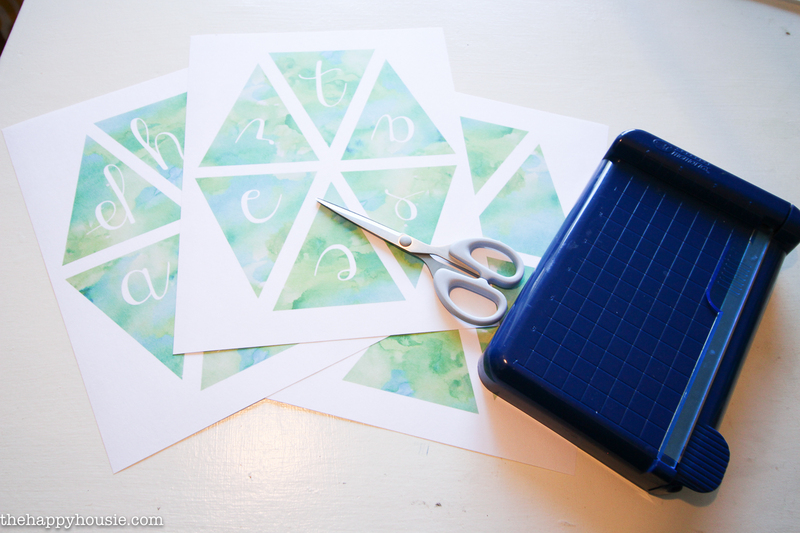 So today I’m sharing a super easy to make (free printable!) 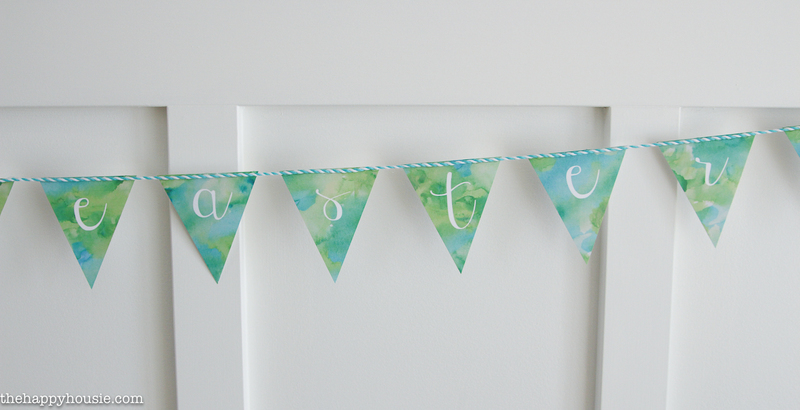 happy easter banner in case you’re hankering to add a little fresh spring colour to a blank spot in your home. I’m so thrilled today to be joining up with an amazingly talented group of bloggers, all offering a free Easter Printable! I love these seasonal hops, hosted by Kristin of Ella Claire Inspired blog; I can never quite get over how crazy creative the printables that are shared are; and the fact that they are all available for FREE download! This year I decided to go with something a little different then my typical framed printable (though I do have some of those coming soon, as well). Now that we have repainted the whole dining room and kitchen to be white; I love the way that colour pops against the all the white paneling! 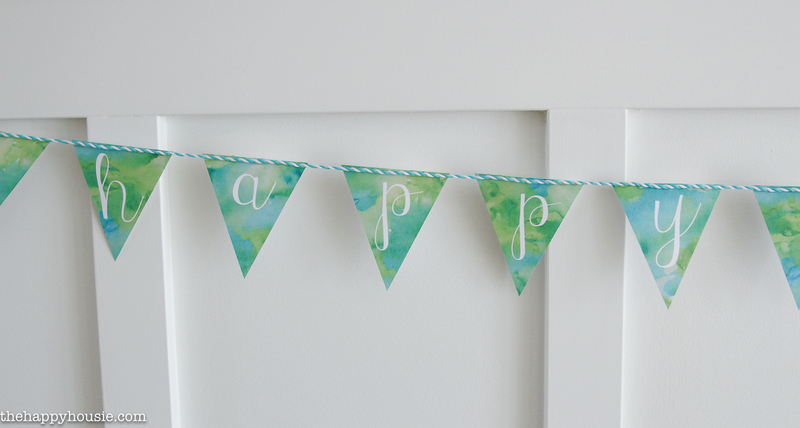 So I decided to create this simple and beautiful “happy easter” printable banner to accent out board and batten. And while I was at it, I figured that I would make it available in a few different colours in case you have a different scheme going on in your home this Easter season! To make this I printed out the three pages on some white card stock, cut it out loosely with scissors and then used my small paper cutter to give the banner edges nice straight lines. I hot glued some cute string across the front of it, using equal spacing between the flags of the banner, and then hung it up using some carefully hidden clear tape! 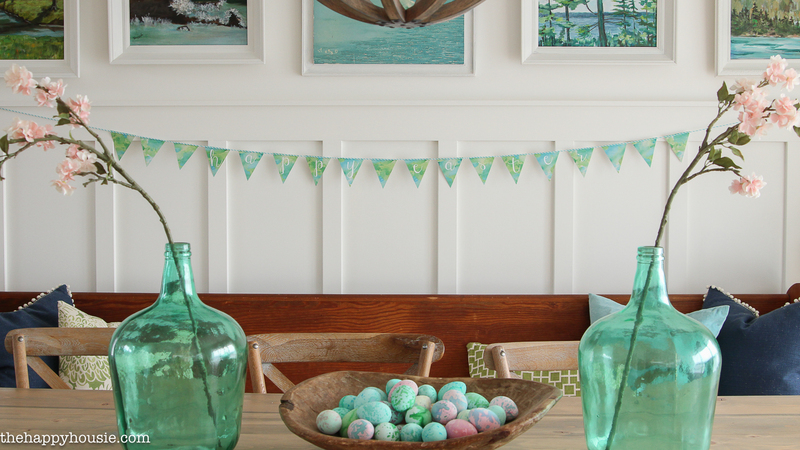 I love how well this particular coloured banner works with all the aqua and greens in our dining room prints and big glass demijohns. Oh… along with the colours of those Easter Eggs. They’re another easy little DIY I’ll be back to share soon! You can download the printables in different colours yourself by clicking here or the button below to subscribe. 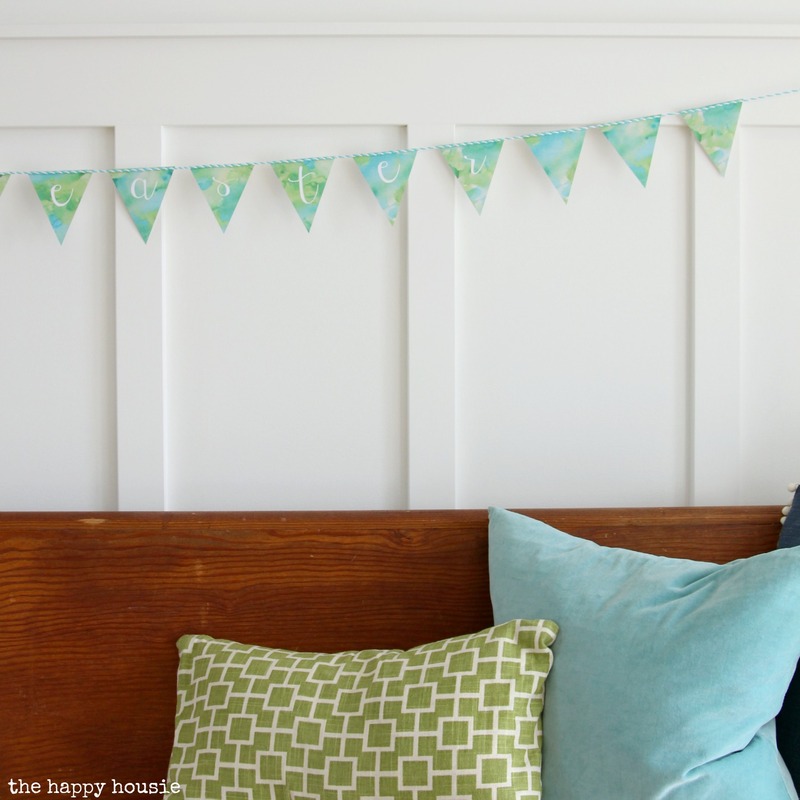 And as I mentioned, the talented Kristin of Ella Claire is hosting this lovely free printable hop. You are bound to find a ton of things you love!! So pretty! I adore the colors! Thanks for sharing your crafty inspiration on this week’s Monday Funday Party! What a great banner, Krista! Love the different colours! 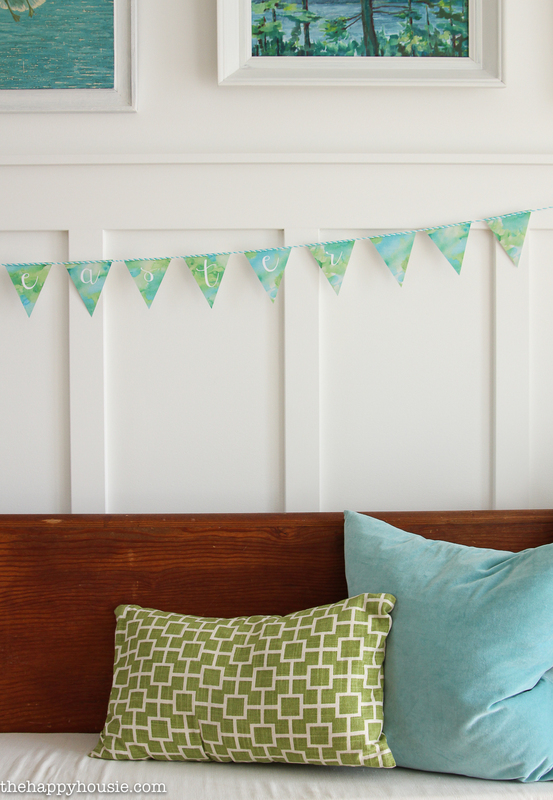 I love your aqua garland! And your home is gorgeous, I love the board and batten! Ok, off to share your post on my FB page. I’m trying to get through the whole list of gorgeous printables! Just darling! I love how you added different colors, Krista! So pretty! I’m in love with water colors right now!